After three years in the settlement, Warlimpirringa approached Daphne Wiliams of Papunya Tula Artists with a request that he be allowed to paint and soon after other elder artists began to instruct him. He completed his first work for the company in April 1987 and became the first of the brothers, all of whom have gone on to become painters of renown, to paint on canvas. Following his first exhibition in Melbourne in 1988, the National Gallery of Victoria purchased all eleven of his paintings. Warlimpirringa’s art almost exclusively depicts sacred Tingari images representing important men’s sites in his country. They include Marua (Marawa), his remote birthplace south west of Wilkinkarra (Lake Mackay). It was here that in the Dreaming narrative, a large group of Tingari men were burning the countryside in search of a kangaroo. At their best these works vibrate and mesmerize. The laminations in the painted surfaces visually warp and morph into the heated sand ridge and dune country that comprise the textured desert topography. While primary market interest in his work has always been strong Warlimpirringa’s works have met with mixed fortunes at auction. His highest price has been the very healthy $48,000 achieved at Sotheby’s in July 2006 for a work entitled Maw Maw Yntjipi 1999. This Papunya Tula Provenanced work carried a presale estimate of $40,000-60,000 (Lot 119) and measured 183 x 152 cm. His next highest result was achieved at Joel Fine Art’s final sale prior to closing its doors in June 2008. 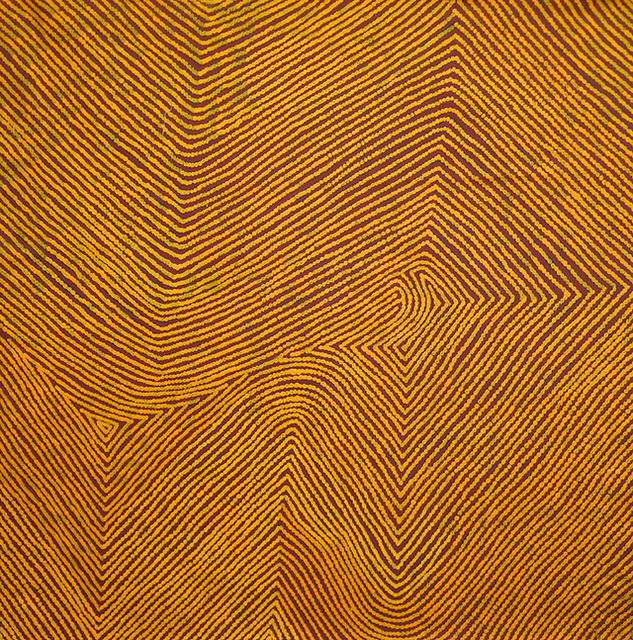 Tingari at Marawa 2000 sold for $24,400, a disappointing result given the estimate of $30,000-40,000 (Lot 53). Overall his clearance rate at auction is a low 45% while the average price of those works that have sold is a more respectable $7,224. Amongst the many important collections that hold his work are the Kelton Foundation in Santa Monica, USA, the Macquarie Bank, Sydney. Musee des Arts Africians et Oceaniens, Paris and of course the National Gallery of Victoria, Melbourne. His exhibition history is impressive as is the number of influential books in which he is included. The work illustrated above was created in January 2008 and is 118 x 176 cm. in size. It is an attractive piece depicting the path the Tingari ancestors traveling, creating and shaping sacred ceremonial sites and is rendered in a minimalist aesthetic which should more than compliment the right contemporary setting. The delineated sections in the painting represent claypans and soakage sites in this extremely remote location.